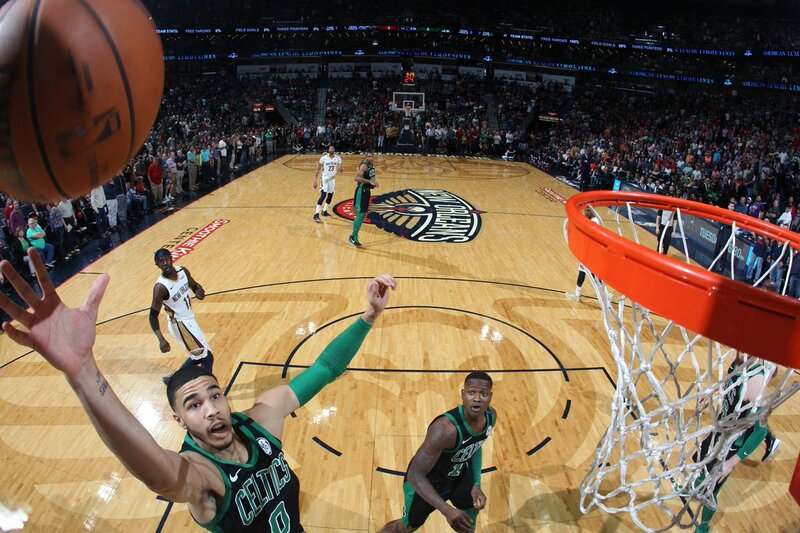 The Boston Celtics looked ready for the battle with Anthony Davis and the Pelicans Sunday night but lost steam in the second half as New Orleans rolled to a 108-89 victory over the Celtics. Boston was strong out of the gate, as a Terry Rozier three, Jayson Tatum and-one, and Marcus Morris fader gave the Celtics a quick 8-0 spurt to open the game. Although Davis eventually got 10 points in the quarter, Al Horford and the Celtics made life tough on the All-Star, as it took him nine shots to get there. Their defense on AD was much improved compared to their last meeting with him in Boston - at least for the time being. On offense, Morris stayed hot all quarter for Boston, putting up a game-high 11 points in the first 12 minutes of action. He also grabbed four boards and a steal. #Celtics lead at the end of the first 28-20. Tatum really got going in the second, scoring seven of Boston's first 12 points of the quarter, courtesy of an array of nifty moves. However, New Orleans' sophomore big man, Cheick Diallo, had a large presence off the bench for head coach Alvin Gentry. In just three minutes, the Kansas product had his way in the paint with a quick 10 points and a pair of boards. This production kept the Pels right there with the green while Davis was resting on the bench. Pelicans starters' first-half scoring: 0, 2, 2, 2 ............. 19. New Orleans came storming out of the halftime intermission. Led by AD's three field goals, they shot 8-12 as a team to start the quarter and gained an edge on Boston. The Celtics followed that up by hitting six straight shots, three of which from Rozier and two of which from Greg Monroe, to help settle the Pelicans' storm. Still, Davis and Nikola Mirotic were able to build an 11-point lead halfway through the third. #Celtics allow 35 points in the 3Q, trail #Pelicans 82-76. Tatum 23, Morris 14, Rozier 13, Monroe 12; Davis 27, Mirotic 14, Diallo 14 (ties season high). Boston surrendered an 8-3 Pelicans run to start the final frame, all while Davis was resting on the bench. Abdel Nader could've changed that, but he missed four straight free-throws, points that the C's offense desperately needed at that point. They went on to score just five points in the first eight minutes of the fourth. Davis - who, this time, got some great play from his supporting cast - and the Pelicans continued attacking Boston's defense. They had a 20-point edge in the paint and looked to be a lot more hungry for a win. The Celtics watched New Orleans blow the door right off the hinges from there, as the Pels rolled to a 108-89 victory. Tatum led the Celtics scoring with 23 points, while Morris finished with 17. Davis had 34 points and 11 rebounds for the Pelicans.